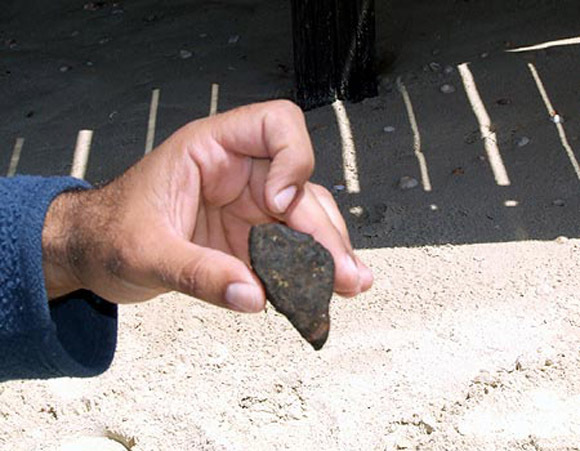 That's no space rock: The Israeli 'meteorite' that never was (Ilan Lilush, Tel Aviv Police). UPDATE (April 25): The unidentified combustible object has been identified as being “man made” rather than anything cosmic in origin. Also, it looks like my original assertion that this resembled an incendiary device wasn’t far off. This object contained high quantities of phosphorus, a chemical commonly used in incendiary weapons. “The object had high concentrations of phosphorus, which is naturally ignited when it comes in contact with air and with inflammatory material,” Gavrieli added. However, I still stand by my theory that the Moonpeople are behind it. ORIGINAL POST: It has all the hallmarks of being a meteorite: It’s on fire! There’s smoke! Hell, even the BBC is reporting about it! That’s right, isn’t it? When a chunk of rock flies through the Earth’s atmosphere it burns bright, sometimes exploding during re-entry, scattering the ground like a hellish incendiary device? Scary stuff if you’re standing underneath the cosmic fireball. However, looking at the video above, that’s no meteorite. Sure, when a chunk of space rock enters the Earth’s atmosphere it produces light and flame due to atmospheric ram pressure heating the outer layers, producing a trail of ionized gas. But it’s also worth remembering that space rock is very cold (as it’s been deep frozen in space), so the brief heating during re-entry will not heat the cold rock up substantially when it makes landfall, definitely not enough to make it combust when it lands. Re-entry happens for a very short time, although the shell of the meteorite might heat up a little, the insides of the meteorite remain very cold. Even if the rock was heated up during those few fiery seconds of re-entry, it will decelerate very quickly, falling to the ground at terminal velocity. This would have the effect of cooling it down some more. In fact, it’s been reported that frost has formed on meteorites as soon as they land. That’s radically different to what we’re seeing here. Even if this could possibly be a meteorite, what’s burning? Last time I checked, space rock didn’t burn like a firework and produce smoke like a signal flare. And meteorites certainly don’t contain any nitroglycerin. That is unless the Moonpeople are throwing bombs at us again, but I’ll save that theory for another day. Thanks Avi Joseph for pointing me to this video!